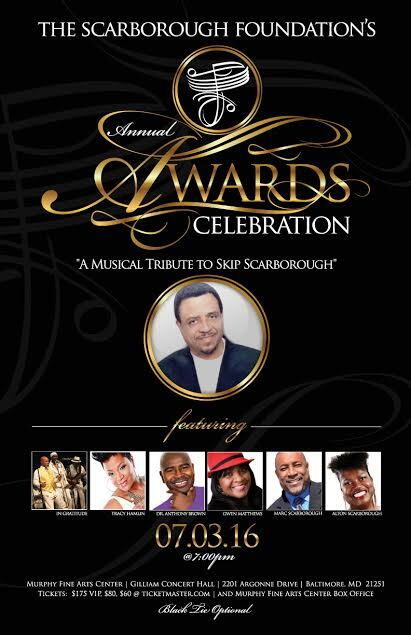 Baltimore, MD – June 30, 2016 - The Scarborough Foundation is hosting its inaugural Scholarship Awards Celebration titled, "A Musical Tribute to Skip Scarborough" on Sunday July 3, 2016 at 7:00 pm at the Murphy Fine Arts Center located at 2201 Argonne Dr., Baltimore, MD 21218, on the Morgan State University Campus. Skip Scarborough has been referred to as the "Greatest Songwriter You Never Heard Of." This Grammy Award Winning Songwriter, Producer and Musician’s credits include such classic hits as: "Can't Hide Love" and "Love's Holiday" (Earth,Wind & Fire),"Lovely Day" (Bill Withers), "Don't Ask My Neighbor" (The Emotions), "Love Ballad" (LTD), "Giving You The Best That I've Got," (Anita Baker), and "It's Alright With Me" (Patti Labelle) to name a few. The soulful night of music features performances by The Earth, Wind & Fire Tribute Band, IN-GRATITUDE and R&B Recording Artists Tracy Hamlin, Dr. Anthony Brown, Marc Scarborough, Gwen Matthews and Alton McClain Scarborough, formerly of the hit 70's Disco girl group, Alton McClain & Destiny. The evening, hosted by TV/Radio Personality, and Songstress Angela Stribling includes the presentation of scholarships to deserving Maryland Public School Students. Highlights of the evening include the ALEXI Lifetime Achievement Award in Music Industry presented to Earth Wind & Fire (Pre-taped). Morgan State University's Marching Band Director of 43 Years, Melvin Miles, Jr. will be presented the ALEXI Lifetime Achievement Award in Music Education. Receiving the ALEXI Community Service Award for her work in the Park Heights Community is Dr. Hattie Bailey, CEO of Project Success Youth Place - Out of School Time Program. To request an interview with The Scarborough Foundation or any of the Award recipients, please email the media contact above, no later than Sunday, July 3rd by 12 PM.